Hindu religion defines five essential signs of marital status of women which are mangalsutra, sindoor, nose ring, toe ring and bangles. Though each of the five signs is equally important but mangalsutra holds special significance for a married Indian woman. Mangalsutra is termed as one of the most precious ornament for Indian women as along with sindoor it symbolizes her blessed fortune to have a long lived life partner. Generally mangalsutra is made up of two strings of black beads that are usually small in size along with a gold pendant. Furthermore, the gold pendant comprises of two or more comparatively bigger gold beads. These beads usually have a shape of small bowl. These are the most basic specifications regarding the built and design, and variations in the designing patterns of mangalsutra are evident from state to state. Like, in contrast to a north Indian Mangalsutra that may be made-up with plastic thread, a typical south Indian Mangalsutra is made exclusively with a cotton thread of yellow color. Today in the Indian subcontinent, mangalsutra has become a fashion statement as well. The influence of television serials and movies has presented it as a trendy ornament. Today, jewelry showrooms are packed with a vast variety of Mangalsutras. Generally people prefer to buy gold mangalsutra, but now few other precious and semi precious metals are also used in making mangalsutra. As per the affordability, one can choose from a wide range of gold plated mangalsutra, silver mangalsutra, gold mangalsutra or mangalsutra engraved with diamonds a well. Though, Mangalsutra is a tradition in all states of India, but it essentially belongs to the married women of south India. In some states of south India Mangalsutra is also known as thalli, thaaly or mangalyam. In southern belt of India, wearing Mangalsutra is a strongly followed custom. At the time of south Indian wedding, there is an important ritual called mangalya dharanam (wearing the mangalsutra), wherein the mangalsutra is tied around the bride's neck with three knots. In some traditions the groom ties the first knot and the rest two are tied by the groom's sister. The significance of joining of the beads in one string in the mangalsutra is that, 'just like each and every bead makes a contribution in the aesthetic necklace, the woman has to blend and integrate into the new family'. There are some traditional believes related to mangalsutra as well. It is believed that the black beads are the protector from the evil and eyes of bad people. So married woman wear the mangalsutra for the protection of her husband and marriage. 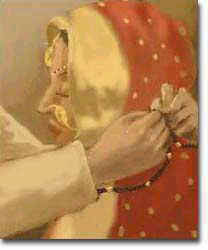 Mangalsutra gifted by the groom to the bride represents his dignity and love towards her as well. Lastly, many ancient traditions have disappeared in the mist of time but mangalsutra has been able to maintain its significance and still no Hindu marriage is considered complete without the mangalsutra. Wearing mangalsutra is an important conduct for a married women. Its a symbolic of Deity Shiva and Deity Shakti. From a mangalsutra the desire and knowledge energies are also emitted. Good post. Provides good information.